Grindstone Stables Sleigh Rides Opening Day — DiscoverRUIDOSO.com | Plan your Ruidoso getaway here! Join us for a horse-drawn sleigh ride through historic Upper Canyon! With jingle bells ringing and the horses breath fogging in the air, everyone is sure to enjoy the crisp winter evenings while riding through the oldest part of Ruidoso. 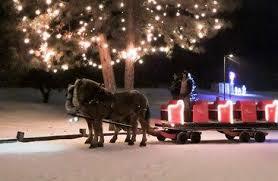 Although snow is not always abundant in our southwest resort town, we are always able to offer our sleigh rides. With or without snow. With the addition of a few hidden wheels, our sleighs will travel smoothly, even on dry pavement. They are always pulled by a team of draft horses adorning bells, ensuring a magical evening. Rides start each evening at 5:30 pm. Blanket are furnished for all riders.